Concerning "Designation in Uneven Hierarchy", we learned methods for "Absolute designation according to the job title, "Relative designation according to organization hierarchy, and "Methods of separating business processes, designating approver". As the last of this series, I will introduce a past article that describes "Method of separating the starting position according to job position". 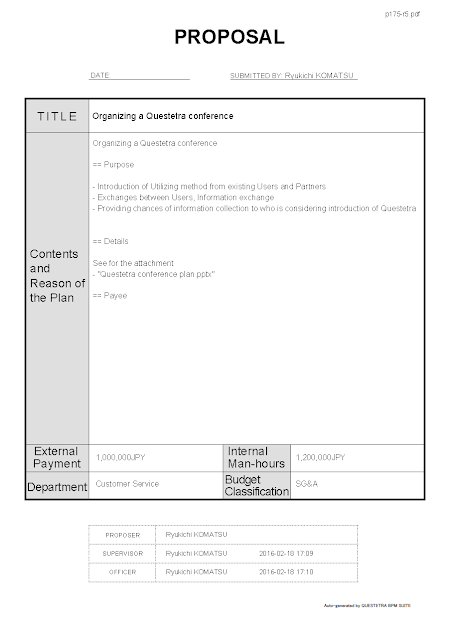 Even though it is a similar idea to "Method of separating business processes", it addresses by separating the start position in one business process in this article. Although it is a "method of starting by boss" instead of "method of designating boss", please keep it in your memory as one of the methods of designing a Workflow App for an organization with variations in its hierarchy. The act that to ask authorized people for decision-making is not necessary because the director him/herself is an authority. Particularly, if the decision-making is for matters within the budget of the department. However, even so, a rule that "Must create Approval request document" is adopted in many companies. That is, they are standing on a perspective that "Intentions which have been formed in the organization will be preserved in documents as records". Also, they are assuming efficiency in corresponding to audit. Yet, it indeed is cumbersome that "to make request, and then approve it by oneself" on a Workflow system. 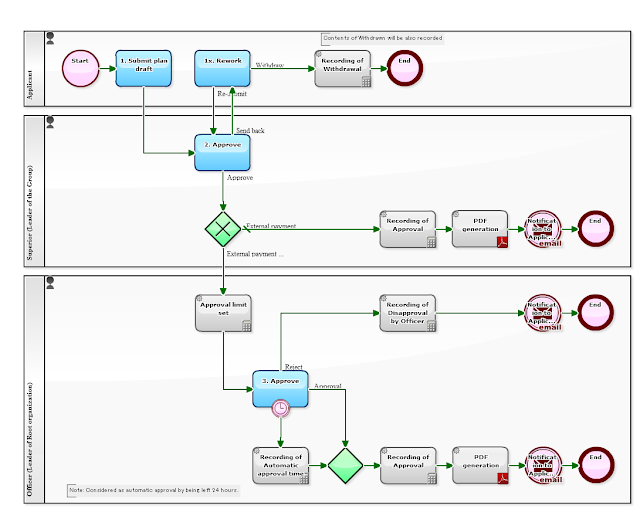 The following Workflow is a modified version of "Episode 462: Planning - Approval (Starter Template)", which has been compiled in Basic Business operations 2016 edition. 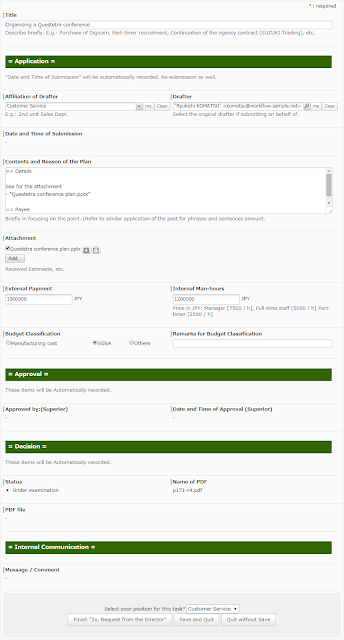 Users who have "Managers role" are able to submit their approval requests via a flow which does not pass through "2. Approval". 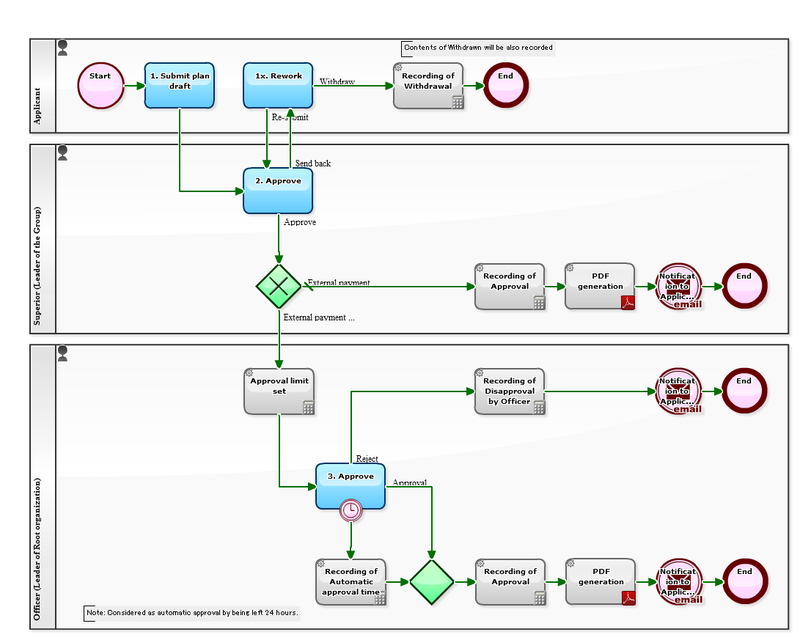 As you see in comparison between the Business Flow Diagram before the modification (below), this Diagram has been added a Step of "2x. Request from the Director" at the top. That means a User who has "Director role" is able to Start this Workflow from "2x. Request from the Director". There is no "Double effort" on the flow. Planning-Approval flow in "Episode 462: Planning - Approval"
Incidentally, (it is obvious as well,) the request will automatically go to "3. 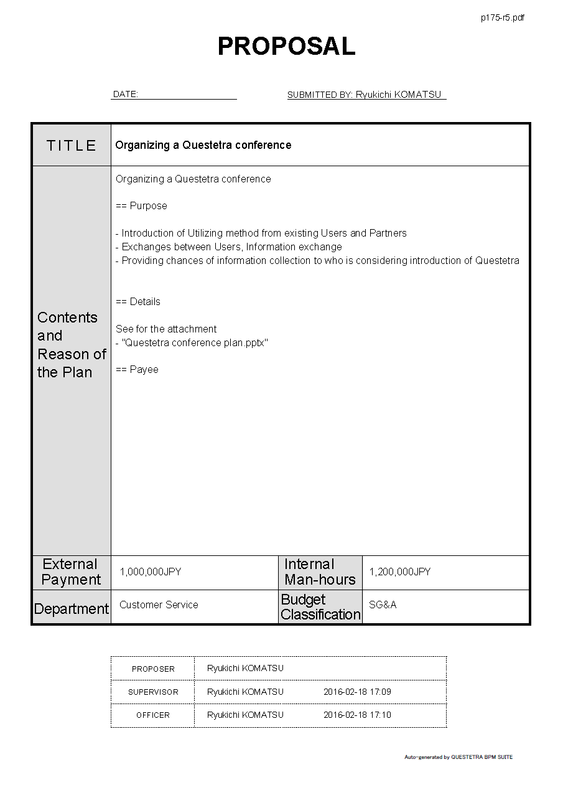 Approval by Officers" despite it is a from a director, if "External payment of more than 1 million JPY" occurred. That is if the officer made a judgment of "disapproval", the decision itself becomes invalid. 'Mmm, well then, divide it into less than 1 million...' Such an idea seems "kind an ulterior motive", but it probably cannot be helped because that is the rule.